One tonne of recycled paper saves 3 tonnes of wood and 100,000 litres of water. Each tonne of recycled paper creates meaningful employment and Rs. 40000 in wages. By blending waste cotton rags, denim cutting and kraft paper; the range of recycled paper is flexible and can be widely expanded. The recycled paper and products have wide acceptability among user due to high level of customization. for institutions, corporations and foundations. The most popular TARA Paper Recycling Technology TARA PaperMek ® – XV for Institutions caters to the requirement of the customer to produce diverse quality of paper that can be used within the institution and for local markets. The range of end-use applications includes writing quality paper, card paper, files and folders for office use. The TARA Paper Recycling Enterprise can recycle one tonne of waste paper per month; higher capacity is also available.This unit is capable of producing up to 15000 Kg of finished paper. A higher value addition can be achieved through custom designed products. The capacity for recycling can be enhanced incrementally. High quality writing paper can be produced with the use of TARA Hollander Beater. TARA Beater 3.5 Kg/charge TARA Beater manufactured with high quality stainless steel is used for preparation of pulp with input of cotton rags, denim cuttings, jute and other cellulosic fibers. TARA Calendering Machine 24", width of rolls The TARA Calendaring Machines is used for cold polishing of the dried sheets of paper by placing individual sheets within Galvanized Iron or Zinc sheets. The machine is fitted with electronic safety devices. 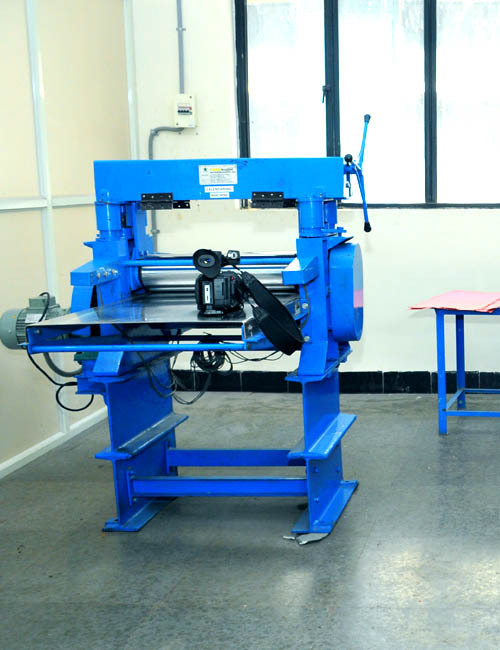 TARA Semi-Automatic Cutting Machine	 33” size of blades The TARA Semi-Automatic Cutting Machine is a precision cutting machine with various functions that are electrically operated. The machine has electronic safety devices. Why should you choose TARA PaperMek® - XV ?